Most of the following publications are available from multiple retail and internet outlets. 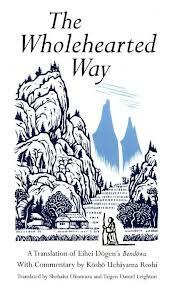 The Mountains and Waters Sutra: A Practitioner’s Guide to Dogen’s “Sansuikyo” by Shohaku Okumura (Author),‎ Shodo Spring (Editor),‎ Issho Fujita (Foreword),‎ Carl Bielefeldt (Contributor),‎ Gary Snyder (Contributor) Wisdom Publications, 2018. Paperback, 328 pages, $17.95. “Mountains and waters are the expression of old buddhas.” So begins “Sansuikyo,” or “Mountains and Waters Sutra,” a masterpiece of poetry and insight from Eihei Dogen, the thirteenth-century founder of the Soto school of Zen. Shohaku Okumura, one of the most renowned scholar-practitioners of Dogen in the world, guides the reader through the rich layers of metaphor and meaning in “Sansuikyo,” which is often thought to be the most beautiful essay in Dogen’s monumental Shobogenzo. Boundless Vows, Endless Practice: Bodhisattva Vows in the 21st Century by Shohaku Okumura (Author),‎ Shodo Spring (Author),‎ Densho Quintero (Author),‎ Centre Shikantaza (Author),‎ Eido Reinhart (Author),‎ Doju Layton (Author),‎ Shoryu Bradley (Author),‎ Hoko Karnegis (Author),‎ Shoju Mahler (Author),‎ Kaikyo Roby (Author),‎ Jokei Whitehead (Author), Dōgen Institute, 2018. Paperback, 212 pages, $10.00. 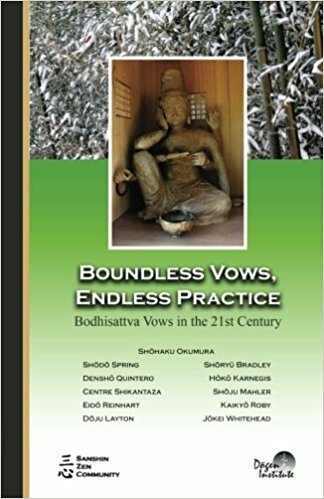 In honor of Sanshin Zen Community’s 15th anniversary, Shohaku Okumura and ten of his dharma descendants from around the world present a series of writings on making and carrying out bodhisattva vows in the 21st century. The book includes new translations by Okumura Roshi of material never before published in English. 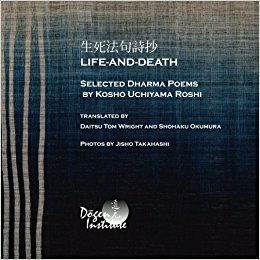 Life-and-Death: Selected Dharma Poems by Kosho Uchiyama (Author),‎ Daitsu Tom Wright (Translator),‎ Shohaku Okumura (Translator), Dōgen Institute, 2018. Photos by Jisho Takahashi. Paperback, 26 pages, $12.00. Deepest Practice, Deepest Wisdom: Three Fascicles from Shobogenzo with Commentary by Tom Wright (Translator),‎ Shohaku Okumura (Translator),‎ Kosho Uchiyama (Commentary), Wisdom Publications, 2018. Paperback, 344 pages, $19.95. In Deepest Practice, Deepest Wisdom, Kosho Uchiyama, beloved twentieth-century Zen teacher addresses himself head-on to unpacking Dogen’s wisdom from three fascicles (or chapters) of his monumental Shobogenzo for a modern audience. The fascicles presented here from Shobogenzo, or Treasury of the True Dharma Eye include “Shoaku Makusa” or “Refraining from Evil,” “Maka Hannya Haramitsu” or “Practicing Deepest Wisdom,” and “Uji” or “Living Time.” Tom Wright and Shohaku Okumura lovingly translate Dogen’s penetrating words and Uchiyama’s thoughtful commentary on each piece. The Zen Teaching of Homeless Kōdō, by Kosho Uchiyama Roshi (Author), Jokei Molly Delight Whitehead (Editor), Shohaku Okumura (Translator, Commentary), Wisdom Publications, 2014. Paperback, 288 pages, $17.95. Eschewing the entrapments of vanity, power, and money, Kōdō Sawaki Roshi lived a traveling and “homeless” life, going from temple to temple, student to student, teaching and instructing and never allowing himself to stray from his chosen path. Always clear, often funny, he jolts us into awakening. See associated study page. 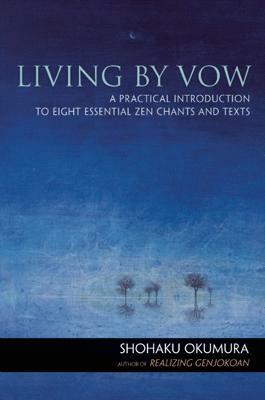 Living by Vow: A Practical Introduction to Eight Essential Zen Chants and Texts, by Shohaku Okumura, Wisdom Publications, 2012. Paperback, 220 pages, $19.95. This immensely useful book explores Zen’s rich tradition of chanted liturgy and the powerful ways that such chants support meditation, expressing and helping us truly uphold our heartfelt vows to live a life of freedom and compassion. Now also in Italy from Ubaldini Editore — Introduzione in Italiano qui. 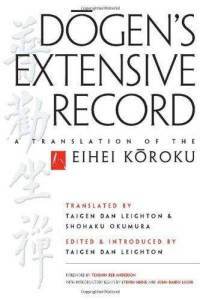 Dogen’s Extensive Record: A Translation of the Eihei Koroku, by Eihei Dogen, trans. Shohaku Okumura, Wisdom Publications, 2010. Paperback, 824 pages. $26.95. Dogen’s Extensive Record is the first-ever complete and scholarly translation of this monumental work into English. This edition contains extensive and detailed research and annotation by scholar, translator, and Zen teacher Taigen Dan Leighton, as well as forewords by the 18th-century poet-monk Ryokan and Tenshin Reb Anderson, former abbot of the San Francisco Zen Center. Dogen’s Genjo Koan: Three Commentaries, by Eihei Dogen. Translations and Commentaries by Nishiari Bokusan, Shohaku Okumura, Shunryu Suzuki, Kosho Uchiyama , Sojun Mel Weitsman, Kazuaki Tanahashi, Dairyu Michael Wenger. Counterpoint Press, 2012. Hardcover, 240 pages. $18.95. Dogen’s Genjo Koan is the first chapter of his Shobogenzo, and for many followers it might be thought to contain the gist of Dōgen’s work—it is one of the groundwork texts of Zen Buddhism. This unique edition contains three separate translations and several commentaries by a wide variety of Zen masters. 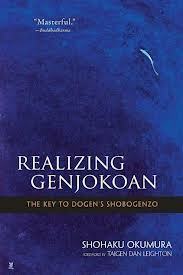 Realizing Genjokoan: The Key to Dogen’s Shobogenzo, by Shohaku Okumura, Wisdom Publications, 2010, $16.95. A comprehensive introduction to the teachings and approach of Dogen Zenji. A thorough guided tour of the most important essay in Dogen’s seminal work, the Shobogenzo. This volume also includes an introduction to Dogen’s life from Hee-Jin Kim’s classic, Eihei Dogen: Mystical Realist, with updated annotations by Okumura. Paperback, 328 pages. Opening the Hand of Thought, by Kosho Uchiyama, editors: Shohaku Okumura, Tom Wright, Jisho Warner, Wisdom Publications, 2004. Paperback, 256 pages, $16.95. By turns humorous, philosophical, and personal, this is above all a great book for the Buddhist practitioner. It is specially useful for those who have not yet encountered a Zen teacher. This expanded edition includes new prefaces, an index, and extended end notes. The Wholehearted Way, by Eihei Dogen and Kosho Uchiyama, Translators: Shohaku Okumura, Taigen Dan Leighton, Tuttle Publishing, 1997. Paperback, 224 pages, $18.95. A translation of Eihei Dogen’s Bendowa, one of the primary texts on Zen practice. Transcending any particular school of Buddhism or religious belief, Bendowa, or A Talk on the Wholehearted Practice of the Way, was written in 1231 A.D. and expresses Dogen’s teaching of the essential meaning of zazen (seated meditation) and its practice. This edition also contains commentary by Kosho Uchiyama Roshi, a foreword by Taigen Daniel Leighton, and an Introduction by Shohaku Okumura. 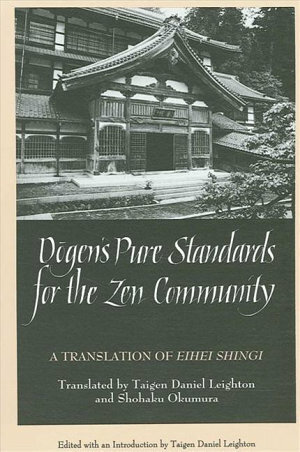 Dōgen’s Pure Standards for the Zen Community, A Translation of Eihei Shingi. Translators: Taigen Dan Leighton, Shohaku Okumura, State University of New York, 1995. Paperback, 294 pages, $33.95. This is a complete translation of Eihei Shingi, the major writing by the Japanese Zen master Eihei Dogen (1200-1253) on monastic practice and the role of community life in Buddhism. Eihei Shingi contains Dogen’s principal guidelines and instructions for everyday life and rituals in the monastic training center he established. Included are a collection of dramatic teaching stories, or koans, on the attitude and responsibilities for practitioners in the community, the only collection of traditional koans with this practical focus. Shobogenzo Zuimonki, by Eihei Dogen, translated by Shohaku Okumura and Tom Wright, Sotoshu Shumucho, 2009. Available in a free, downloadable version. The dharma talks of Eihei Dogen Zenji (1200–1253) who transmitted Soto Zen from China to Japan. Heart of Zen, by Eihei Dogen, Menzan Zuiho and Kosho Uchiyama, translated by Shohaku Okumura, Sotoshu Shumucho, 2016. Available in a free, downloadable version. Soto Zen: An Introduction to Zazen, by Shohaku Okumura et al, Sotoshu Shumucho, 2016. Available in a free, downloadable version. Includes zazen instruction with photos, texts on zazen, and commonly-used chants. Realiser Genjokoan, La Clé du Shôbogenzo de Dôgen, par Okumura Shohaku. Almora, 320 pages, Date de parution : 09/02/2016. Réaliser Genjôkôan est une introduction complète à l’enseignement et à l’approche de ce grand mystique, nous guidant dans une lecture de son essai le plus important: le Genjôkôan. Le Genjôkôan fut écrit en 1233; il n’est autre que l’introduction au Shôbogenzô (Le Trésor de l’OEil du vrai Dharma), le chef-d’oeuvre de Dôgen et ce texte contient l’essentiel du bouddhisme. Notre guide pour ce voyage est Shohaku Okumura, un maître zen contemporain éminent, qui a consacré sa vie à traduire et enseigner Dôgen.